2. Website – The ACDA website has a brand new look with lots of new features! 3. Newsletter – The newsletter has been redesigned and streamlined! 4. Store – A new store with the ACDA logo on your favorite products with a designated portion of the proceeds benefiting the ACDA! Today marks the official unveiling of all the efforts by the ACDA over the past year to implement design changes and present the most current information available to our registered families and the public. The ACDA began in 1996 and we are so excited to enter our 20th anniversary year in 2016 with our new look. Please read more detailed information about the changes below. We hope you will spend some time exploring and sharing our redesign! The website has been carefully crafted to be a one stop portal for anything and everything related to ACDMPV. We not only wanted to provide current genetic and research information but also grief resources and community resources. Essentially anything related to ACDMPV has been consolidated into one location with easy to navigate menus. We hope you will visit the new website and share it far and wide with your friends and family. New design – Fresh new look optimized for both desktop and mobile platforms. Information – All content is now the most up to date information available, including genetics, research, FAQs, etc. We also added numerous new pages, such as a summary of NORD grants, maps, history of the ACDA, links for medical professionals, etc. Donate – The donation page is easier to navigate and includes instructions on how to donate directly to either the ACDA or the NORD Research Fund (ACD). Social Media – Our Twitter and Facebook feeds are now linked directly to our website, along with the ability for visitors to share our content through social media services. Grief resources – Recommended support groups, book lists, song lists and links to personal blogs written directly by ACDMPV parents. Community resources – Links to every newspaper, magazine or blog article written about families affected by ACDMPV. Fundraisers – Summaries of current and completed fundraisers organized by ACDA families. Please contact us at secretary@acdassociation.org if you would like us to add a description of your fundraiser benefiting ACDMPV research. 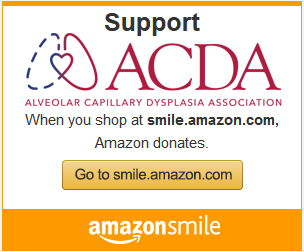 Store – An easy to use store with the ACDA logo on your favorite products with a designated portion of the proceeds going to the ACDA. Ships internationally to many countries!